Create a pouch out of a regular envelope. 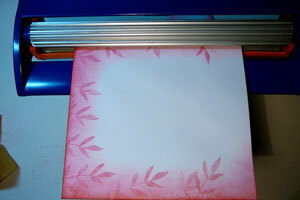 Use your paper trimmer to cut 1 1/4" from one of the short sides of the envelope. 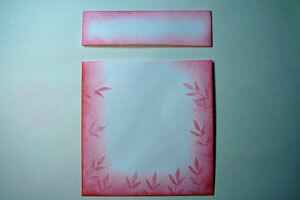 The narrow piece will be the topper and the larger piece will be the crimped pocket portion of the card. Decorate both pieces with stamps, keeping in mind that the bottom piece will be crimped and the images may be slightly distorted. Place the larger piece into the crimping tool with the opening to the side, and crimp. 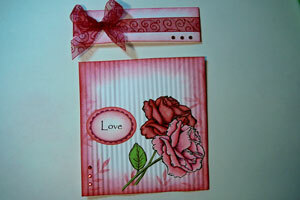 Add stamped/cut images, die cuts and embellishments as desired. To create the insert, cut a piece of card stock to 4" by 4 1/4". For a layered look, cut additional pieces slightly smaller. Stamp and embellish insert as desired. As a variation you can scale the project down to create gift card holder. You've seen the tutorial, now you try it! We've got a section of the gallery set aside for Crimped Envelope Pocket Card. Try this technique, then upload your artwork to the gallery. Show us your creations! Could you tell me where you got the ribbon? I've seen it on a number of cards and can't find it online. I love this idea. It would make a great workshop project for me. I just signed up to be a demonstrator and looking for ideas. BEAUTIFUL card... LOVE the colors! What set is that rose from? I love it!!! love these roses! what stamp co. are they from? Theresa, that is a wonderful idea! And I love the roses, the ribbon and the whole colour scheme! Ohhh, Love it!! It's that extra touch! This is so unique. Thanks for sharing it with us. Hi and thank you all so much for the wonderful comments. Julia - The ribbon is from my local stamp store. I believe the supplier is called Creative Impressions. I found them online once, hoping to buy some. They sold them in fairly large spools, so it was cost prohibitive to buy a variety of colors. I am sure you can find them by doing a search of Creative Impressions, but if you can't, just let me know and I will try to dig up the web address. 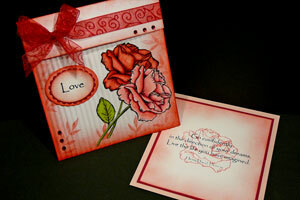 Tina and Pam - The rose stamp is from a set called A Year of Flowers from Gina K Designs. It was illustrated by Melanie Muenchinger. Thanks for sharing such a great idea. I was looking at you blog, you do wonderful work.. Thank you so much for showing it to us. I saw this many years ago...glad to se it revived! 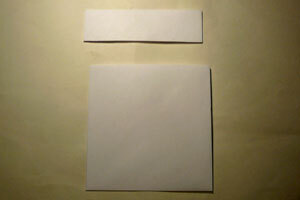 I am new to this, can you tell me exactly what an A2 size envelope measures. This is just awesome! I love the technique and colors you used. I have to do this one. I love this idea, especially crimping it this way, and the ribbon around the top piece. LOVE THE ROSES. WHAT STAMP SET IT THIS? Phyllis - the A2 envelope like I used in the tutorial is 4.375 inches by 5.75 inches. If you don't have that size, you could use any size envelope you have on hand, but may have to adjust the size of the insert to fit. Sandy - It is called A Year of Flowers from Gina K Designs. 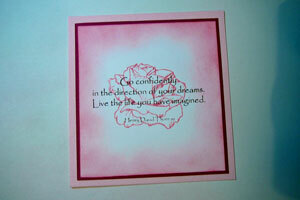 I really love this - I have tried to use crimped paper and card before but when sticking I tend to lose crimping effect. 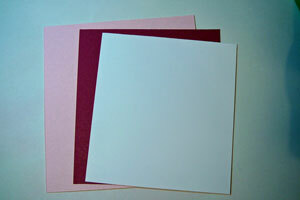 Could you advise how best to stick to crimped paper as well has what to use to adhere crimped paper to card. 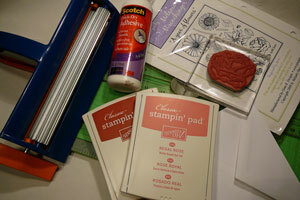 Gill - I use Scotch Quick Dry Adhesive whenever I am working with textured papers. I use a "glob" of it to work into the grooves. If I am using dimensionals, then I add the glue to those, too. That keeps me from having to "smoosh" down on the crimping. I saw something very similar that my upline had done. It was a gift enclosure and a Gihardelli chocolate fit into it. So cute for a Valentine treat or special treat for a friend. Theresa is an illustrator and designer who lives in northern California with her husband and daughter.